Duncan, u r not payin'attenchun tue that sign; in fact u really look like u r laffin'at it! Great pic Duncan. You're a country boy at heart. Yep time for a sit down protest we say. Have a wonderful Wednesday. Guess you Showed "THEM", Duncan. NOW go ahead... DO IT... DO IT Duncan... PEE on that silly sign. Hope you don't get arrested! We think Frankie and Ernie have a great idea...hope you followed through. Guess you showed them huh Duncan!!! Another useless government sign. Just you sit and relax! 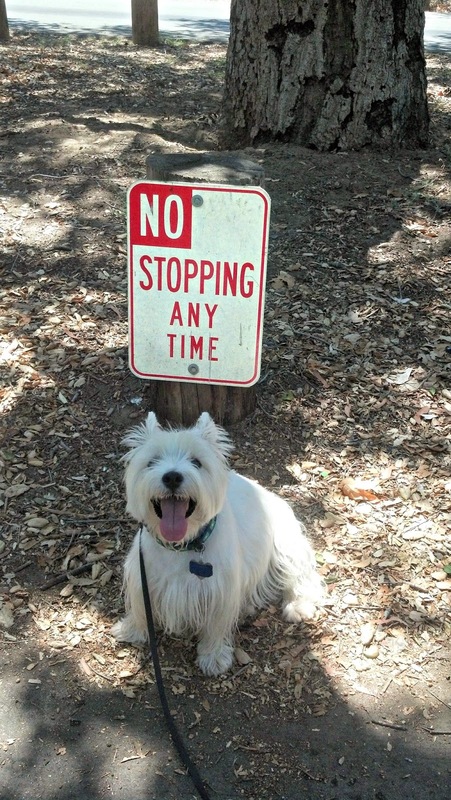 Westies don't let no one tell em what to do. Humans and their silly signs! BOL!! We are your newest followers, so happy to meet you! Happy WW! Dat's right, no stoopid sign's gunna tell ya whut to do!! Bwaaaaahahahahahaha ... they NAILED it! Happy Oktoberfest; Drinking game, anyone?? My head has sprung a leak! You have GOT TO BE KIDDING ME !!!!!!!!!!!!!! Thankful to have known Greta! Don't forget tomorrow is a special day! How to be Dangerous by Duncan B.
Ruby's look alike is in our book!! I am INFLUENTIAL. Who knew??? I won, I won!!! Thanks, Sarge! !